From the effortlessly stylish Fossil jewellery collection, this eye catching bracelet is designed to stand out. Crafted in grey leather, charmingly accentuated by a contemporary stainless steel studs, this distinctive piece is ideal for her everyday wardrobe. 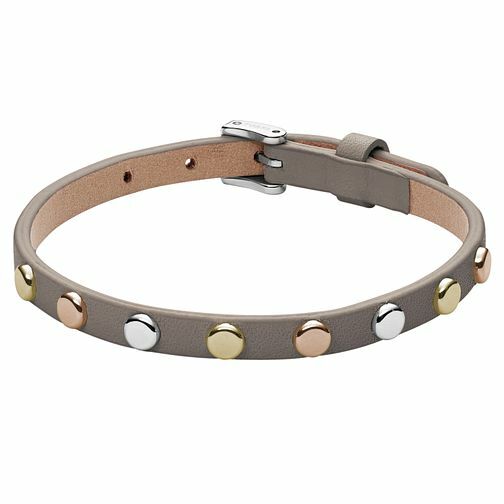 Fossil Grey Leather Studded Bracelet is rated 3.0 out of 5 by 2. Rated 1 out of 5 by Anonymous from Description and picture are completely wrong I ordered this expecting a grey bracelet with silver studs, I got a different bracelet that was a different shade of grey and had different coloured studs! Nothing like the picture or description, very dissapointing. In the shop they checked other stores and confirmed the description online is completely wrong. Rated 5 out of 5 by Anonymous from Really nice piece and good for all seasons Really delicate and nice to layer with other wristwear. Mixed metal studs add a really nice touch to this piece which can be easily adjusted to a persons wrist size.